Before POS materials can be placed on the shop floor, an entire logistical process must first be completed. We run the entire process from our warehouse in Sneek, from request to final delivery. We receive, check, bundle and pack POS materials. We also handle shipping and can organise storage units across the country. This allows you to keep all aspects under one roof, which is both efficient and effective! Reception: We receive goods, count and check the packing slips, and book the goods received goods in our (online) stock management system. Storage: We store the materials and make them available for online ordering via our portal. This means that available stocks and ordering history can be checked at all times, and that orders can be placed online. Bundling and picking: Our strengths include client-specific or store-specific order picking and (re)packaging of POS materials. Distribution: We supply to distribution centres or direct to stores. It is also possible to arrange delivery to storage units. 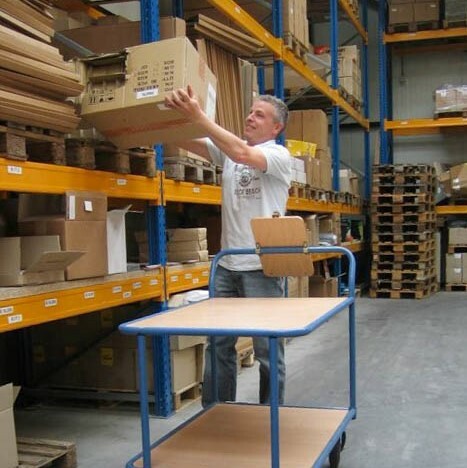 Storage units: We arrange storage units where necessary and deliver the materials to these. We can also arrange return logistics from these units.